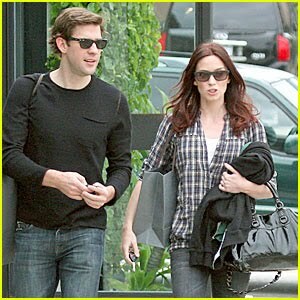 Emily Blunt and John Krasinski (pictured, left) were married on Saturday in Italy, and Carrie Underwood and Mike Fisher tied the knot in Georgia on Saturday as well. On the Emily/John union: "It was an outdoor ceremony and absolutely beautiful," says an insider. George Clooney and Italian girlfriend Elisabetta Canalis were in attendance; Blunt and Krasinski had been staying at Clooney's nearby Lake Como estate since the July 4th weekend. "It was an official ceremony. They are husband and wife," adds the source (according to usmagazine.com. After about a year of dating, The Office star Krasinski, 30, proposed to British actress Blunt, 27, with a 3-carat Edwardian diamond and platinum ring from Neil Lane, worth $100,000. Carrie and Mike released this statement on their nuptials: "We could not feel more blessed to have found each other and to have shared this day with our friends and family that mean so much to us!" the newlyweds said in a statement they signed "Mike and Carrie Fisher." The two walked down the aisle in front of more than 200 guests at the Ritz Carlton Reynolds Plantation in Greensboro, Ga., in a ceremony estimated to cost more than $500,000, according to RadarOnline.com.